Clear jelly or cloudy seedless jam? We now compare the raspberry jams made with the muslin and the food mill. I was surprised by the result, but very pleased : the cloudy seedless jam, made with the food mill, won on taste. Raspberries were picked on the same day. Some were juiced with the muslin, the others were pureed with the food mill (see 22 September post). Same amount of sugar added: 800g par kilogram of juice and puree. Same amount of lemon : juice of half a small lemon per kilogram of juice and puree. Redcurrants : 150g of redcurrant juice was added per kilogram of raspberry juice and the same proportion of redcurrant puree was added to the raspberry puree (adding redcurrants sharpens the taste of raspberry jam and helps it set). Before cooking I decided to add 100g more redcurrants per kilo of raspberry juice, to further help the jam set, as I would normally do when making a jelly. This would create a discrepancy between the two lists of ingredients, yet only a minor one. The additional redcurrants in the jelly could make it taste slightly more acidic, that would be all. Overall, the differences in the final result would be mostly due to the fact that one of the jams was made with fruit juice and the other with fruit puree. – As expected, the jam made with the juice was clear and the jam made with the puree was cloudy. – The jelly tasted sweet, the cloudy seedless jam more fruity. Both of us preferred the cloudy seedless jam. Such a strong flavour of raspberries ! 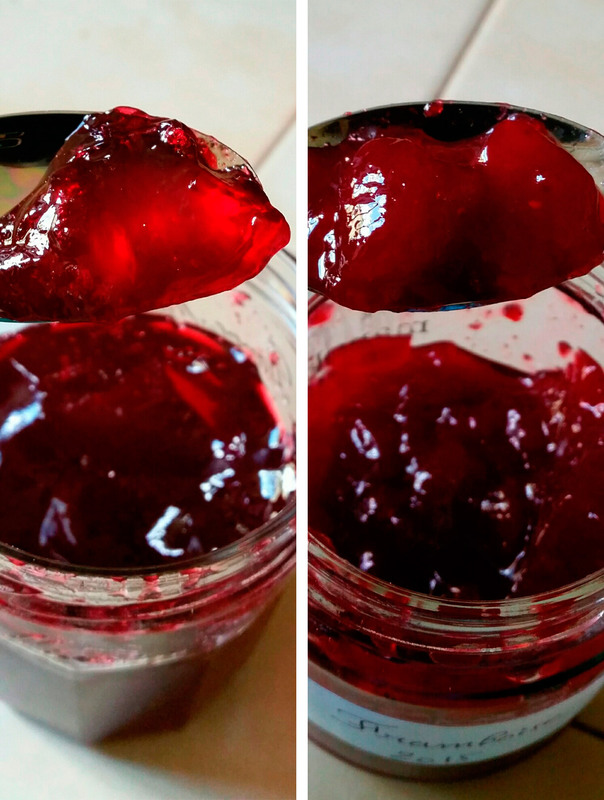 Clear jelly versus cloudy seedless jam, made from the same batch of fruit. Photos Jac C., 19 August 2015, Aurillac, Auvergne, France. The difference in taste came as a surprise to me. I would have thought that the jelly, often considered as the most refined type of jam, would have been the winner on this attribute. But in fact it tasted of sugar, both as a first note and dominant characteristic, whilst the seedless jam had more complex flavours, felt fuller. It is a bit like sugars : pure white sugar is less good than the tastier and somewhat more nutritious unrefined sugar. Thinking about it now, I am not that surprised. I tasted the raspberry juice and puree before adding the sugar, and the puree was significantly more tart, a good sign in the steps towards a tasty jam. I was really pleased with this result. The seedless jam, which already had the advantage of using more of the fruit and being easier to make (see 22 September post), also tasted better than the jelly. Of course this is just one test, made with a particular batch of raspberries, picked in one place on a certain day of the summer of 2015. Only two persons took the test. Other people might have had a different perception, they could have noticed more of a difference in textures for instance and preferred the jelly. The recipe also played a part. A raspberry jelly made with less sugar, for instance 400g per kilogram of fruit juice, and some added thickening agent to compensate for the imbalance created by a lower proportion of sugar, might have won the test against a seedless jam made with 400g of sugar per kilogram of raspberry puree. Yet to me the difference in taste was so noticeable that this test remains valid. It contributes to the following conclusion : In soft fruit jam making, pureeing the fruit is better than juicing it. It is more convenient, uses more of the fruit and makes a better product, a cloudy seedless jam that contains more of the nutrients and tasting qualities of the original fruit. Last but not least ? 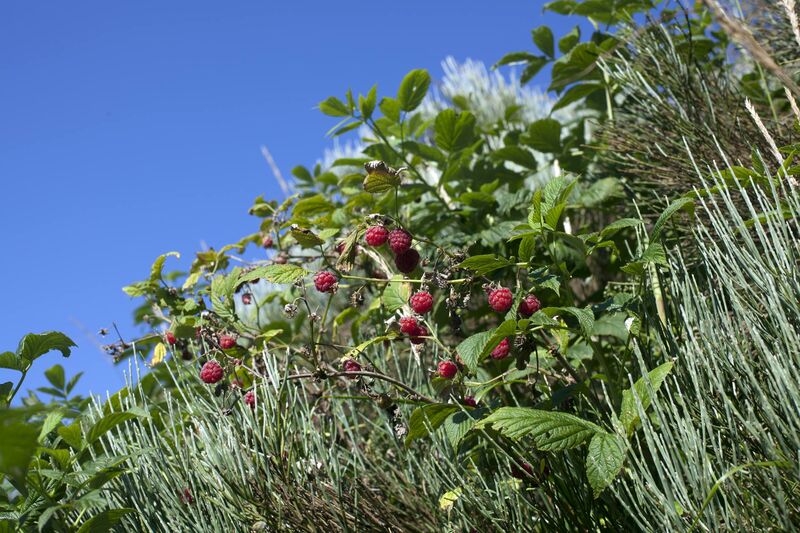 The perfectly ripe raspberries used for the test were picked in the wild on a sunny day of a favourable summer. They were among the best raspberries we have ever tasted. Good enough to make this rather unorthodox test of sensory analysis conclusive? My answer is “yes”. I will continue to explore ways of making jam, for instance jellies using a juice extractor rather than a muslin. Yet, more than ever, using fruit puree to make a cloudy seedless jam will be my default choice when making soft fruit jam, because it is the best choice in my view. Using wild fruit to carry out the test activated my senses. To me, it widely contributed to validating its results, giving it some sort of timeless value. I have been thinking for several years now that including ingredients from the wild in product testing could be a major improvement in food innovation. Findings could then be applied to grow and process food better. The raspberries pictured here were the ones used in the above test. Photo 12 August 2015, Auvergne, France. This entry was posted in Eat and tagged All-fruit, Aurillac, France, Raspberries, Soft-fruit by Les Jardins d'ici. Bookmark the permalink.